Members meet once a month to discuss the business of the chapter and to enjoy presentations on rail and transit history that are not limited to the Lehigh Valley region, Examples of the variety of recent topics include rail operations in Cuba, the handling of Michigan iron ore, and a pictorial history of the transit operations between Allentown and Reading. These meetings are supplemented by special social activities such as outings on area passenger short lines. We also engage in artifact preservation, including ownership and restoration of a 1922 Mack Model AB Motor Car, and participation in the acquisition and restoration of the only existing diesel locomotive once rostered by the Lehigh and New England - Alco S2 switcher number 611. Finally, we maintain a research archive of smaller artifacts, documents, photographs, and publications. 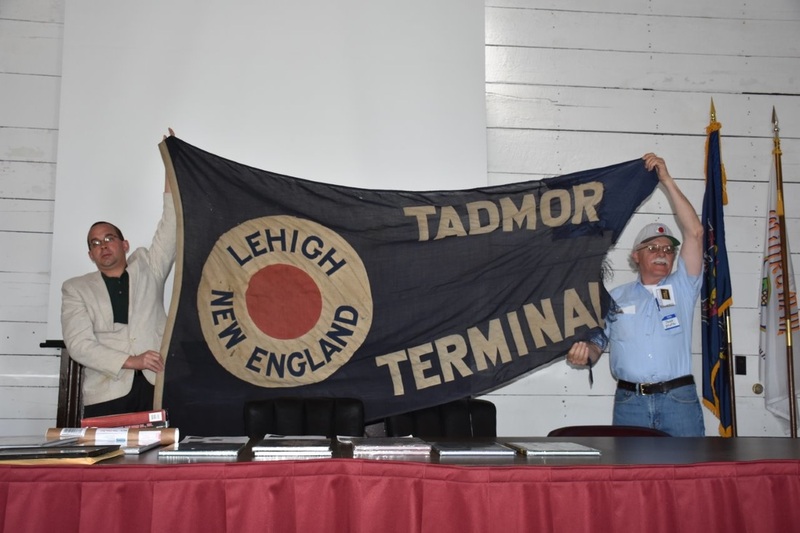 An example of a recent acquisition is an LNE facility flag for its Tadmor switching yard near Bath, shown being donated by Jake Stofko (right) to RHLV President Jim Rowland (photo by Kermit Geary, Jr.).